At the water park, kids can enjoy castles, water slides, and waterfalls in the pool. 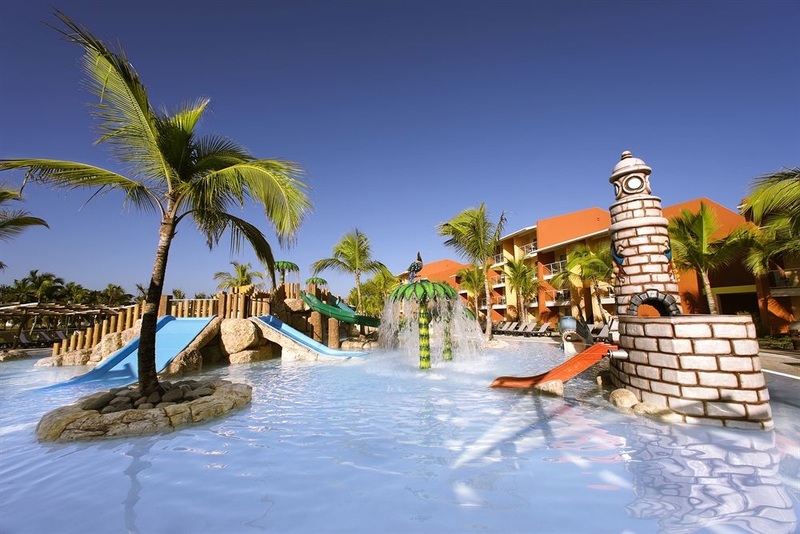 Barceló Bávaro Palace Deluxe is a family-friendly resort with four pools and a waterpark. The all-inclusive Barceló Bávaro Palace Deluxe is located on the beach in Punta Cana. The resort has 4 swimming pools, including one for children, one for adults, and a semi-Olympic pool. A water park and kids club make this a great resort for families, while couples might want to consider the adults-only Barceló Bávaro Beach located in the same complex. Make yourself at home in one of the 1,402 air-conditioned rooms featuring minibars and flat-screen televisions. Rooms have private balconies. Wireless Internet access (surcharge) keeps you connected, and satellite programming is available for your entertainment. Private bathrooms with shower/tub combinations feature complimentary toiletries and hair dryers. Grab a bite to eat at one of the resort’s dining establishments, which include 11 restaurants and a coffee shop/café. While enjoying a refreshing dip in the resort pool, you can order your favorite drink at the poolside bar. Relax at the full-service spa, where you can enjoy massages, body treatments, and facials. You can get some exercise with a round of golf or enjoy a lazy day at the private beach. This resort also features wireless Internet access (surcharge), babysitting/childcare (surcharge), and supervised childcare/activities. Featured amenities include a business center, dry cleaning/laundry services, and a 24-hour front desk. Planning an event in Punta Cana? This resort has 123785 square feet (11500 square meters) of space consisting of a conference center, conference space, and meeting rooms. A roundtrip airport shuttle is provided for a surcharge (available on request), and free self parking is available onsite. Fly into Punta Cana International Airport, in the Dominican Republic (PUJ). The resort is about 30 minutes away. The resort provides shuttle transportation for a surcharge, although they often run promotions that include free shuttle service. Visit Barceló Bávaro Palace Deluxe’s website for more information.